We often get carried away in Scotland with the presence of our big name courses and occasionally dredge up that awful phrase the Hidden Gems when talking to visitors. But if we can avoid cliches there really is so many wonderful places top play golf with names that you've never heard of. 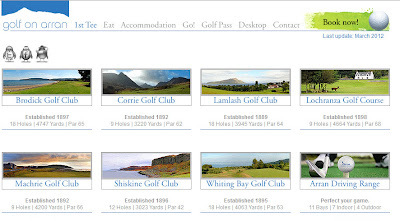 In Argyll you could play Dunaverty; or Dragon's Tooth near Fort William; Tain or Golspie in the North Highlands or you could hit one of my favourite places The Isle of Arran and play one of seven great courses featured on the Golf Arran website. I've only played Brodick and Shiskine but my neighbour plays every year in a company outing and swears by it. It is simply different and if experiences are what travel is about then golfing in Arran has to be on the bucket list. Find out more about the golf on Arran and then investigate the produce, the Island Beers and Whiskies and maybe discover some live music along the way. Oh yeah and there's some great Ice Cream too!